Tagicakibau has become a fixture of the Guinness Premiership since his move to London Irish in 2005. The 'Samoan Flyer' has made a name for himself with Premiership fans due to his searing pace, devastating right foot step and ability to score thrilling tries. Tagicakibau was born in Auckland, and attended the famous Wesley College as a teenager. It was here that his rugby skills were honed and upon leaving he was recruited to play for Counties Manukau in the NPC division 2. His coaches at this stage recommended that he switch from flank to wing, seeing his pace and skill levels develop. Tagicakibau's performances that season attracted the attention of the Samoan selectors, and he scored a try on debut against Namibia in a pre-World Cup tour of South Africa in 2003. After being selected for the World Cup squad, Tagicakibau notched tries in the pool games against Uruguay and Georgia before he announced his talents to the northern hemisphere teams with two blistering runs during the pool match against England. Following the World Cup Tagicakibau played a full season for Taranaki in the 2004 NPC under the guidance of former All Black full back Kieran Crowley. Tagicakibau was invited to join up with the Waikato Chiefs Super 12 side following the NPC, playing eight matches for them during the 2005 competition. 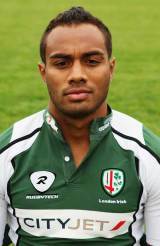 Following his successful switch to London Irish Tagicakibau has represented the touring Pacific Islands against Wales and was also selected for Samoa's 2007 World Cup squad. A disappointing tournament saw them exit at the group stages with only one victory to their name and Tagicakibau only featured in their agonising loss to arch rivals Tonga. Tagicakibau had a successful domestic season in 2007/8, helping London Irish to a Heineken Cup semi final against Toulouse, where he scored a memorable try but was unable to stop his side sliding to defeat. Tagicakibau continued his finr form into the 2008-09 season, helping London Irish to the top of the Guinness Premiership at Christmas.